"It feels great, man, it feels great!" 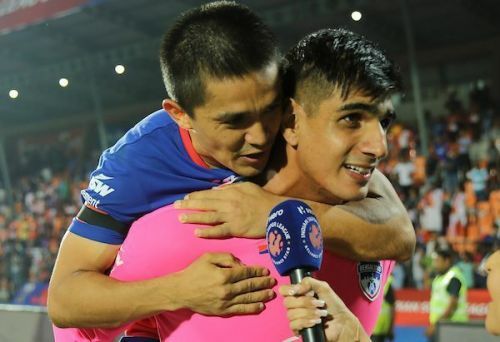 Sunil Chhetri did not hide his happiness as he interacted with reporters on his return to Bengaluru, with the ISL-winning Bengaluru FC squad. Chhetri said that last year's final - where Bengaluru lost 3-2 to Chennaiyin FC spurred the team on this year. "We knew how it felt to lose, so we worked so hard to win the trophy," he said. After last year's final, Chhetri had said that Bengaluru would get to work from the very next day. "Obviously, I didn't mean it that way, but we knew we had to win the trophy, for us to get back in Asia, and I want to congratulate the whole team for doing just that, it wasn't easy at all," Chhetri said. 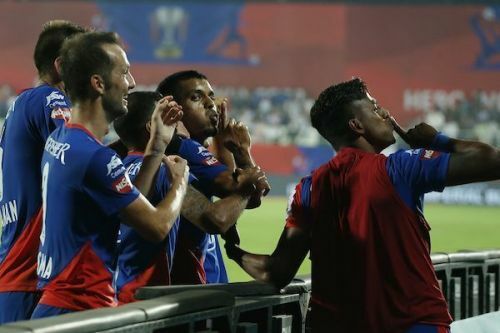 In the interaction, which also featured goalkeeper Gurpreet Singh Sandhu, winger Udanta Singh and Bengaluru FC Chief Technical Officer Mandar Tamhane, one thing was clear - the club valued getting back their spot in the AFC Cup, maybe even more than the trophy itself. "We've created a niche for ourselves in Asia," Chhetri says, "Teams around the continent know who we are, we really want to build on that." Tamhane echoed those views, saying the club treasures the performances in Asia more than anything else. "See, with good Asian performances, we increase India's ranking in the continent, and maybe one day, such consistent performances could see India getting three Asian slots (instead of the current two)." Chhetri added that everyone at Bengaluru FC really wished Chennaiyin FC well in their current AFC Cup campaign, as "that will only be good for Indian Football." Coming back to the final, was there doubt after a recent run of bad form heading into the playoffs? Was there pressure because of Carles Cuadrat's rotation in the latter half of the league phase. "Not at all. There was pressure of the playoffs, but we all knew why the rotation happened. After Erik [Paartalu]'s injury, the coach was worried. He knew we couldn't afford to keep losing players, so the rotation was a conscious decision and all of us embraced it." Chhetri admitted that Bengaluru's high-flying form in the first half of the league phase gave the room to slack off a little. "We knew we had to finish in the top four. Obviously, we wanted to finish top, but our start gave us room to experiment, room for rest, but ultimately, it was about getting to the playoffs and winning the trophy," the skipper said. So, what was the plan going into extra-time in the final, after 90 minutes of Football had the scoreline at 0-0? "Don't concede. Attacking could come later, but we knew we couldn't afford to concede. But, then we had our 'Bhekenbauer'," Chhetri said. Chhetri was effusive in his praise for Bengaluru's match-winner. "Where there's a gap in the team, Rahul [Bheke] is there. Right-back, left-back, centre-back, scoring goals, stopping goals, we can rely on Rahul," the skipper exulted. Chhetri also said his respect for Bheke has grown tremendously over the last two years he's been at Bengaluru. "Sometimes, he doesn't know where he's playing till very late, but he still does a job. It's a shame he's not played for India yet, hopefully the concerned people are listening," Chhetri said. Sandhu, too, was not holding back in his praise for Bheke. "Thank God he finished it off before penalties," he laughed. Was Sandhu confident if the game went to penalties? "Yes, I had my preparation in place, and I was confident I would save a couple," he said. His captain said the team had confidence in Gurpreet. "To score penalties against him, you need to take perfect penalties, so we were confident in him. That's why we knew we could defend in extra-time, even while being a man up, not take any risks," Chhetri said. And that, summed up Bengaluru's ISL campaign. They came, they saw, they conquered. They conquered because of a total faith - a confidence in the abilities of those around them. On and off the pitch.